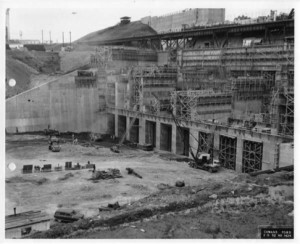 In the year 1959, Duke Energy began the construction on Cowan’s Ford Dam on the Catawba River, creating the state’s largest man-made body of water known as Lake Norman. Four years later, the construction was complete and the hydroelectric station began operating. This project was intended to meet the energy needs of a region that was becoming more and more developed and to help stimulate the local economy. 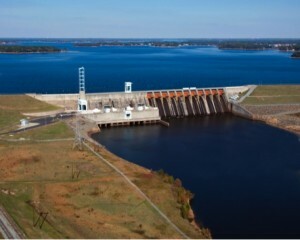 The objective for the creation of Lake Norman was two-fold: to power the dam’s turbines and to provide a site for future projects, including a nuclear plant. In 1965 and 1981, these goals were realized with the creation of the Marshall Steam Station in Terrell, NC and the McGuire NuclearStation, respectively in Huntersville, NC. Surprisingly, the project was met with very little criticism or pushback from the public in the region. Other dams in the southeast were often criticized for being unnecessary, expensive, and displacing hardworking citizens from their land. Although the creation of Lake Norman rendered the historical battlefield at Cowan’s Ford underwater, few people seemed to rally against the project. However, Duke Energy has endeavored to sponsor several memorials commemorating the battle of Cowan’s Ford and the General who lost his life there, General William Lee Davidson, the namesake for two counties as well as Davidson College. These memorials are especially significant because they offer a way for the public to consider the history of the Revolutionary War era in North Carolina without a physical battlefield that can be visited and studied. However, the Catawba River battlefield is not all that was covered by water with the creation of the Cowan’s Ford dam and Lake Norman. Damming the Catawba threatened both wildlife and the unique history of the Battle of Cowan’s Ford, where General William Lee Davidson was killed. The Reedy Creek Conservation Center was founded to inform the public of the wildlife that was lost with the dam’s creation and to preserve those same species. Each of the three links listed below will provide information on the life and legacy of General William Lee Davidson and cover the Revolutionary War battle that took his life, the memorials that serve to commemorate his life and that battle today across the state, as well as an overview of the mission of the Reedy Creek Conservation Center after the dam and lake were created. 2. Betz, Paul and Mark C. Carnes. “General William Lee Davidson.” American National Biography, Supplement 1. Oxford University Press, New York, 2002. 3. Depriest, John. “Battle of Cowan’s Ford Anniversary.” Charlotte Observer. Jan. 20, 2008. 4. Lester, Malcolm. “A Goodly Heritage: General William Lee Davidson; Major William Lee Davidson; and Davidson College.” Hopewell Presbyterian Church, Feb. 1, 2003. 5. Davis, Louise. “Adored Gen. Davidson a Hero for Two States.” The Tennessean Panorama. Sept. 14, 1980. 6. Davis, Louise. “Hero’s Death Added to Gen. Davidson’s Fame.” The Tennessean Panorama. Sept. 21, 1980. 8. Davidson, Chalmers G. Piedmont Partisan: The Life and Times of Major General William Lee Davidson. Davidson College, NC, 1951. 10. Davis, Louise. “Gen. Nash Died Revolutionary War Hero.” The Tennessean Panorama. Sunday, Nov. 23, 1980. 11. Depriest, Joe. “Battle of Cowan’s Ford anniversary.” Charlotte Observer. Jan. 20, 2008. Web. 13. “50 years later: Source of power generation gives life to a community.” Nuclear Information Center. Duke Energy. Oct. 1, 2013. Web.